AlienVault has now combined with AT&T Cybersecurity Consulting and AT&T Managed Security Services to form a new standalone division, AT&T Cybersecurity! USM Sensor - deployed throughout your network to collect logs to provide the five essential security capabilities you need for complete visibility. USM Server - aggregates and correlates information gathered by the Sensors, and provides single pane-of-glass management, reporting and administration. USM Logger - securely archives raw event log data for forensic investigations and compliance mandates. USM All-in-One - combines the Server, Sensor, and Logger components onto a single system. AlienVault's threat Intelligence maximizes the efectiveness of any security monitoring program by providing regularly updated correlation directives. The correlation directives analyze the mountain of event data from all of the data sources, and tell you exactly what are the most important threats facing your network right now, and what to do about them. Our threat experts spend the hours researching the latest exploits, malware strains, attack techniques, and malicious IPs, so you don’t have to. They incorporate this expertise into the library of over 2,000 customizable correlation directives that ship with the USM platform, giving you the ability to detect and responds to threats on day one. The AlienVault Labs Threat Research Team also drives the Open Threat Exchange (OTX™), the world’s largest open source repository of threat information. Unlike other threat data services that restrict access to only a select few, OTX is open to everyone. Their researchers review and validate threat data to ensure that OTX publishes only the most accurate and actionable intelligence. Threat sharing in the security industry remains mainly ad-hoc and informal, filled with blind spots, frustration, and pitfalls. Our vision is for companies and government agencies to gather and share relevant, timely, and accurate information about new or ongoing cyberattacks and threats as quickly as possible to avoid major breaches (or minimize the damage from an attack). AlienVault’s Open Threat Exchange (OTX) delivers the first truly open threat intelligence community that makes this vision a reality. AlienVault OTX provides open access to a global community of threat researchers and security professionals. It delivers community-generated threat data, enables collaborative research, and automates the process of updating your security infrastructure with threat data from any source. OTX enables anyone in the security community to actively discuss, research, validate, and share the latest threat data, trends, and techniques, strengthening your defenses while helping others do the same. Pulses provide you with a summary of the threat, a view into the software targeted, and the related indicators of compromise (IoC) that can be used to detect the threats. Automatically instrument your built-in IDS capability within USM deployments, as well as third party security tools, with the latest actionable threat data from community-generated pulses. 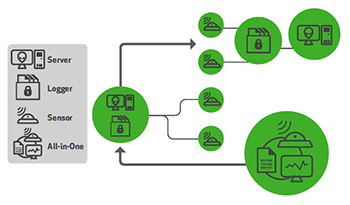 Learn how to use Kill Chain Taxonomy in AlienVault USM to catch threats anywhere on your network, not just at the edge. Contact us to find out more about AlienVault products! Our specialists are expert in designing network security solutions and can help you create a plan for sourcing and deploying your AlienVault solution. Optrics offers personalized AlienVault product training by senior experts - a service designed to help you integrate your AlienVault solution smoothly into your network infrastructure.